It was the best thing we did. We got to see areas that we wouldnt have been able to see due to our timed schedule. The bus ride was smooth, the audio was excellent and of good quality. Speaker was very informative. So glad we did it. But wish it would have had paper towels to wipe the wet seats or offer plastic rain coats due to the rain/mist. The audio system faded in and out during the tour and therefore I missed much of the commentary. Unfortunately the big bus cannot go down many of the streets therefore it is not possible to see the sights The big bus does not work well in San Francisco. Circuit qui fait bien découvrir sfo. Certain quartier ne sont pas vraiment top...des arrêts devraient peut être revus. 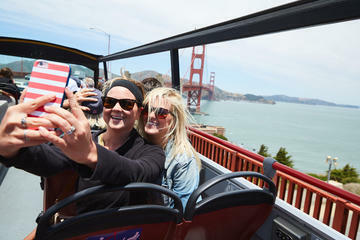 Having never been to San Francisco before, the Big Bus Hop-on Hop-off tour was the perfect way to see the city and get a sense for the spots where we also wanted to spend more time. Awesome way to see The Golden Gate Bridge. Friendly staff, great value. I would recommend these tours when exploring any new city, or bringing friends and family in to town! It provided an opportunity to see a lot for the price. The tour and tour guide was absolutely fantastic. It was cold but well worth it. The tour stopped for a 15 minute break to allow us snacks and hot coffee, tea, and hot chocolate then onward. It was great. Took friends visiting from out of town. Was the best way to avoid parking in the city while visiting the sites. It was great! Be prepared with warm clothes if you wish to go on the upper level.